Vincent WordPress Theme Use the Vincent WordPress restaurant website theme and show the dangerous character of your pizzeria. In an easy way, also run online food ordering system. WordPress restaurant template Check out this new theme in a completely new style! It was created by famous WordPress. After the purchase, you will receive help with template plugin. Moreover, you may count on 6 months support from Pixel Mafia. Have fun together Vincent Pizza Café is a restaurant website theme in an intriguing style. Carefully projected design brings to the website the whole new level of quality. It looks joyful and positive. You are able to upload the pictures of the dishes and share your restaurant’s story. Italian vibes It is the best idea to choose restaurant website template which actually mirrors the character of your food place. Should you go for Vincent Pizza Café? This option is fantastic for places like pizzeria or café. It is because Vincent Pizza Café has positive Italian vibes and gives a chance to share photos of pizza and coffee from quite a delicious perspective. Way to develop Did you know that such an uncomplicated thing as purchasing a new one of restaurant templates may bring countless benefits to your food business? 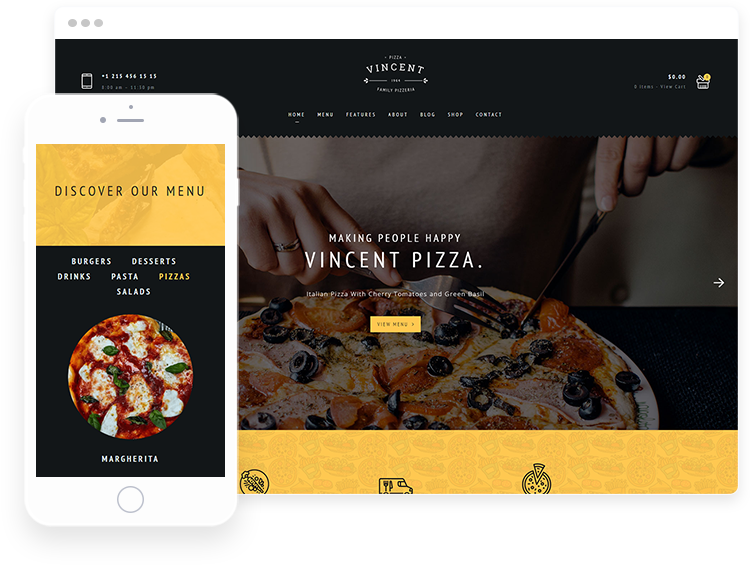 For example, WordPress restaurant theme such as Vincent Pizza Café catches the attention of many Italian cuisine fans. Thanks to it, they will likely become your new customers in no time.